More great info straight from Tetra! Fall is a beautiful time of the year. But, sometimes that beauty can be hard on your pond, especially if you have trees nearby. 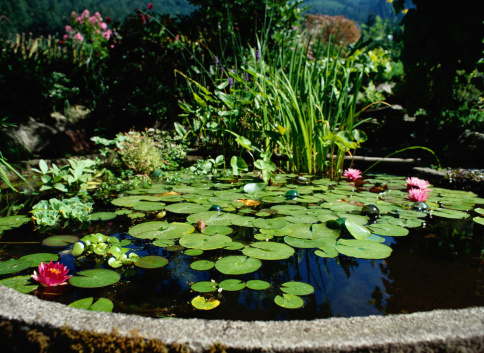 In the fall, it is very important to prepare your pond by cleaning it out, protecting it from falling debris and maintaining your equipment, especially if you live in cooler climate zones. Before winter sets in, invest in a TetraPond Pond De-icer. Gases produced by decomposing organic material are toxic to fish when they are trapped beneath the ice covering the pond’s surface. In small ponds, the TetraPond De-Icer is especially helpful in preventing ponds from freezing solid. Remember, for fish safety, it is extremely important to never break ice on the pond because the shock waves can be detrimental, and sometimes fatal, to fish. Reduce the number of leaves falling into the pond with netting. Most pond retailers carry different sizes that can be hung over the pond like a tent. Or, you can build a frame across the surface. Remove any floating debris regularly with a hand net. Installing a skimmer unit will also save you time and effort. Disconnect the pump, filter and UV clarifier before water freezes. Store UV clarifier indoors for protection. Store filters indoors (if manufacturer’s directions suggest). Sink a few clay pots or weighted-down, clean buckets into the pond to provide refuge (in place of the protective plant cover that will disappear). Frogs who have taken up residence in your garden will also benefit from a place to hibernate. For breeds especially sensitive to the cold, like fancy goldfish, bring them indoors. Purchase or have the pond de-icer ready for installation. Great info here from Tetra Pond Products! As water temperatures begin to fall in your area of the country, it is important to transition your pond fish to a highly digestible wheat germ-based food. Because fish are cold-blooded, their metabolism is controlled by the temperature of the water. So as water temperatures start to dip, you’ll need to make some changes to your fishes’ diet. In water temperatures between 39°F and 50°F, wheat germ is ideal to transition fish into the cooler winter months because it digests easily at low temperatures. This is especially important because in the winter, fish metabolism and the pond’s ammonia-reducing biological activity are greatly diminished. And remember, never feed fish when water temperatures fall to 39°F or below. In addition, feed your fish only as much as they can eat in several minutes. If you are able, it is best to feed smaller amounts several times a day, versus one large feeding (not unlike how humans like to eat). For optimal nutrition, TetraPond Spring & Fall Diet transitions fish in and out of the season and reduces thermal stress. That’s important for disease prevention. Follow a Seasonal Feeding Cycle so you can easily determine the best foods to feed throughout the year as indicated by the water temperature. When you use a TetraPond Thermometer , you’ll eliminate all the guesswork in fish nutrition. months, particularly on the topic of filtration. Read more from Tetra by clicking here. they’ve consumed all of their food, offer small amounts at each feeding. later in the day or the following morning. problem if there isn’t a sufficient oxygen supply in the water. increase the area where oxygen and carbon dioxide can be exchanged.